This worth-the-splurge gloss gives a high-shine finish without the bug-catching stickiness of MAC Lipglass. But somehow, it's not so slippery that you'll lick it right off. (This has medium-level staying power.) Color chameleons will love the 35-plus shades. My go-to hue is Spark, a golden-flecked, sheer red that flatters most skin tones. And hey, let's be honest -- it's Chanel. Just holding the pretty crystal-looking tube (that never gets gooey) feels princess-like. This gloss makes your lips feel really dewy and it does not come off right away. it does not require constant re-application. I have several of these very classy glosses. What can I say? I'm addicted. Yes, they cost a few pennies more than the drugstore brands but in this case, you do get what you pay for. On clean lips, they go on smooth, glossy, and with a touch of shimmer. It looks as though they have crushed abalone or pearls in there. Yes, your hair does get stuck on a windy day, but would you rather have a lip gloss be dry? You can go to the department store and sample a couple to find your color. 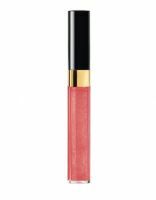 This is a lipgloss that comes in a huge variety of colors and are great for adding a dramatic look to your lips. The gloss is shiny and gives shimmer without being too sticky. It makes your lips look great.